Thank you for visiting the website of the European League of Stuttering Associations. We are performing some restructuring and maintenance at the moment. 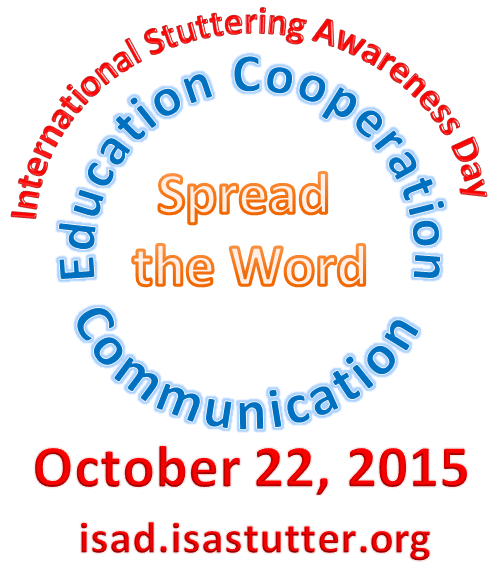 Today 22nd October is International Stuttering Awareness Day. This year is the 10th anniversary of the recognition of International Stuttering Awareness Day (ISAD) by Members of the European Parliament. On 25 October 2005, at the European Parliament in Strasbourg, the European League of Stuttering Associations (ELSA), together with TTM Spain, the European Disability Forum, and representatives of some of Europe’s National Stuttering Associations presented a written statement on stuttering. Following a presentation on stuttering, the work of ELSA and the national stuttering associations across Europe, the International Stuttering Awareness Day was recognised by Members of the European Parliament, Disability Intergroup. The International Stuttering Association has formed a small team made up of Anita Blom, Keith Boss, Dan Hudock, Bruce Imhoff and Hanan Hurwitz to produce and run the ISAD Online Conference. We hope we can live up to the high expectations of previous conference attendees. For participants who need some basic information about stuttering, please read about Stuttering from the American Speech, Language and Hearing Association. Additional information is available on the Stuttering Home Page. The conference is designed for people who stutter, their families and employers, the professionals who work with them, students in training and their instructors. From October 1, papers will be published on a variety of topics related to fluency and fluency disorders. An online forum will also be available, where you can ask questions of experts in the field of stuttering. Communication and emotion are caught up in such a delicate dance, and some of it isn’t pretty. The ability to be heard by others, to listen to what the world has to offer each day, to share readily and easily one’s memories, experiences, opinions and dreams—all contribute to a sense of social completeness and belonging, to feelings of contentment. The reverse is also true. Emotional responses to communication disorders—how we react to the continual threat of being isolated from friends, family, colleagues and peers—can run a complex gamut, sometimes over the course of a single day. Sometimes we accept, other times we might get frustrated, angry or really depressed. Originating in a well-received ASHA convention session, Katherine Preston’s powerful piece profiles two people who stutter who confronted the darkness at the extreme end of this cascading emotional spectrum. With the help of speech-language pathologists, Scott Palasik and Tim returned to the light. The European League of Stuttering Associations (ELSA) is holding a Youth Meeting in July 2014 at a location in the centre of The Netherlands. This is ELSA’s 9th Youth Meeting, the first being in Linköping at the time the World Congress in 1995, the second in Nijmegen in 1997, the third in Mullsjö, Sweden in 2000 and the fourth, fifth, and sixth again in Nijmegen in 2003, 2005 and 2007, the seventh and eight were in Giggleswick in 2009 and 2011. A letter is addressed to the Boards/Committees and offices of every European National Stuttering Association inviting them to nominate up to four people between 18 and 27 years old who stutter to participate in the Youth Meeting. Download the official invitation letter to all associations as PDF. Download the extra letter for participants as PDF.